Now, while she makes it look easy; my tip would be to keep your hands clean, and free from glue, wash them to avoid stickiness or keep makeup wipes on hand. 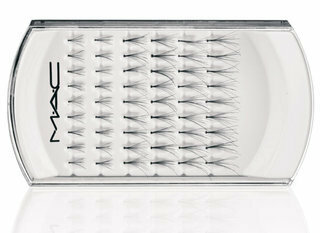 And make sure you space lashes evenly, to prevent clumping. Also, if you make a mistake, wait a minute or so to allow lashes to dry, and then gently pull them off with the tweezers. When it comes to glue, use Duo Adhesive, $25 (the glue that comes in lash packets is hopeless) and MAC lashes $25 are brilliant. “Once they’re completely dry, you can leave them natural like that,” Lisa says "Or add mascara for that finishing touch." It makes an enormous difference - and you will get faster at applying them - I promise. So much so, you could skip the blush contouring, and just go for the individual lashes as part of your regular beauty routine.